web publishing and audience engagement. specifically designed to adapt to every device. Manage your collections, keep track of your objects, make sure they are securely stored, properly maintained, safely insured and readily accessible. Manage any type of collection and archive, from art to natural history and science. Take care of the collection through conservation records and risk management. Full accountability with audit trail, versioning and customisable reports and API. Manage, design and publish your entire collection, as well as your exhibitions, events, guided tours, educational material and visitor information. Show your collection online, including multiple narratives and interpretations. Create exhibitions, events, lectures and educational activities are all included. Engage with your audiences using social media and optimised templates for mobiles. Add a shop, tickets, donations, newsletter, interactive timelines and maps, interpretation, virtual tours, interactive floorplans, mobile apps... and much more! Enhance customer experience with a single shopping basket for all your activities. Dynamic and true-to-life interpretation of your collections with maps and timelines. Have your own unique design and features, using Museums Sites as a starting point. See Museums Sites in action in this fictional museum of Pre-Raphaelites painters. An integrated, accessible and beautifully designed website and collection management system for a fraction of the cost. Build on the standard functionalities and add bespoke features and your own design. Benefit from new features as they are released. Keepthinking is a unique software and digital design agency, offering innovative content and collection management software solutions, as well as design and development of web and mobile applications. Clients include National Galleries of Scotland, the Ashmolean Museum, The British Council and the Horniman Museum. Qi is Keepthinking’s Content and Collection Management Framework. 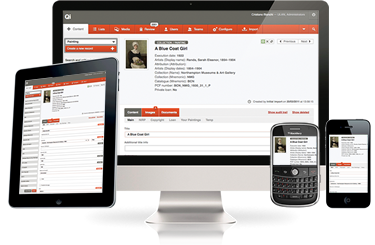 Qi is designed for ultimate flexibility in helping museums manage all of their information using a single, integrated system, instead of a series of vertical applications.